What does literature have to say about the environment? And how do different environments, species, and ecological crises shape the range of literatures and cultural artifacts that humans produce? 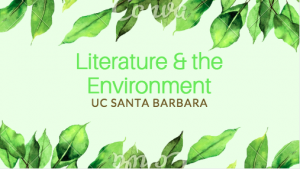 The English Department at UC Santa Barbara is nationally recognized for its groundbreaking work and involvement in the burgeoning fields of ecocriticism and the environmental humanities more broadly. These interdisciplinary fields seek to understand the ways in which art, literature, language, film, and other cultural products allow us to represent, know, and transform the world we share with nonhumans. They also explore the ways in which the material world shapes the production of precisely these cultural products. Ecocritics pay heed to the issues of race, class, gender, sexuality, animality, and histories of colonial exploitation and geographical dispossession in which the study of culture and the environment is necessarily imbricated. L&E faculty work on everything from contemporary to Romantic to Early Modern literature, and their specialties include water and oceans, climate change and the Anthropocene, nature writing, globalization, risk, science and technology studies, and environmental media. Students are able and encouraged to devise papers and projects that bridge centuries, continents, disciplines, and genres and redefine what it means to study literature and the environment at the dawn of the 21st century. Whether you possess a strong background in literature and the environment or a related field, or are simply curious about this growing area of inquiry, we invite you to experience an L&E-centered course, attend an event, or talk with one of our students or faculty about opportunities for getting involved! There has never been a more exciting or, indeed, more crucial time to undertake this work. L&E also works closely with the Environmental Humanities Initiative, also housed in the English Department, which is currently headed by Prof. Ken Hiltner.